Shi-Ben Li (李士本) from Shanxi Province in China went to Eden Social Welfare Foundation as a volunteer during his school vacations, to help someone in need. With the co-work experience with other Eden volunteers, he was inspired so much and the experience was touching inside his heart. The short intersection between the persons in need was left a beautiful memory during his school lifetime. 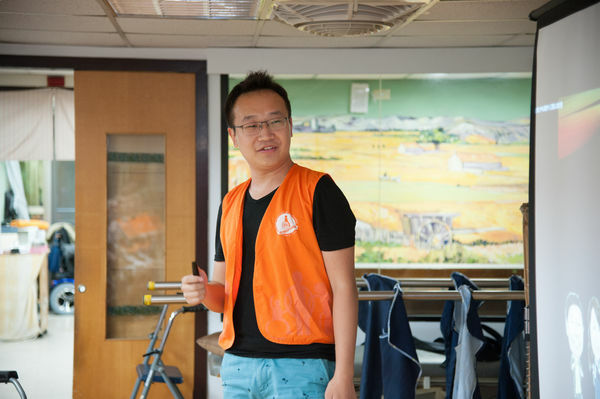 The first time in Yi-shou Care and Rehabilitation Center (一壽養護中心) of Eden, Shi-Ben Li was so shocked when facing the persons with severe disabilities. “They are much more severe than what my imagination was, because they can hardly speak or move.”, Shi-Ben Li said. “We knew that they were glad for some guests coming to visit them.”, even though the welcoming ceremony has no greetings or applause. One of the volunteer’s jobs is to introduce his hometown to the residents in Yi-shou Care and Rehabilitation Center. To achieve a more vivid experience for them, Shi-Ben Li did his best to produce many animations and videos, captured the faces of the disabled as the cartoon characters and led them feel traveling around Shanxi Provence. The persons with disabilities seemed like traveling abroad by their imagination. With the vivid introduction, the residents did a wonderful trip. After the hometown guide, Shi-Ben Li and other volunteers dressed themselves up with aprons, gloves, and masks, to help take food. The person with disabilities serviced by Shi-Ben Li was unable to eat by himself with bad chewing function, so food had to be puréed. He first observed the actions of the caregivers. They used the spoon so fluently and fed the persons with disabilities without any food left on the mouths. 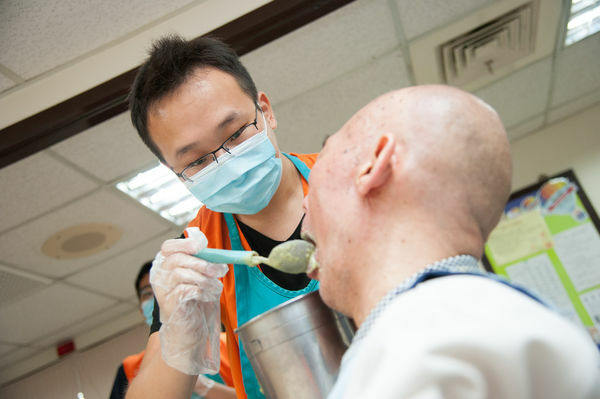 Then, Shi-Ben Li tried to assist, one spoon of food after another was fed inside the mouth of the resident, “I was really scared to scald him, so I acted very slowly.” When the food flew out of the mouth attaching on the chin, Shi-Ben Li would wipe it with a handkerchief right away to make the resident more comfortable. Watching these persons with disabilities residing in the institute, the residents enjoyed themselves in the activities even though their bodies are disabled, living such a happy daily life. 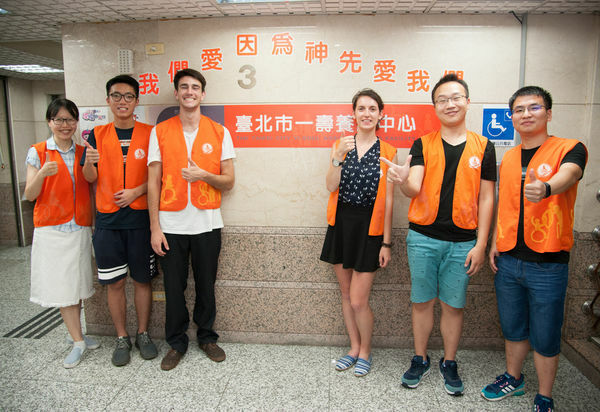 With this volunteer experience, Shi-Ben Li thought if he had been a person with disabilities, could he accept in this situation? He shook his head, “I might give up.” This experience made him have more empathy to warm up people in need. After that, knowing the Eden taking care of persons with disabilities from all heart, Shi-Ben Li felt so touched that even the effort is minor but can cause a big reward. Every part of these services will get together as a big love to nourish persons’ heart.